The Dubai Gold and Commodities Exchange, DGCX, and the Dubai Islamic Economy Development Centre, DIEDC, on Tuesday signed a Memorandum of Understanding, MoU, to share knowledge, promote Shari’ah-Compliant finance, and help foster Dubai as the global capital of Islamic economy. Abdulla Mohammed Al Awar, CEO of DIEDC, and Les Male, CEO of DGCX, signed the agreement at DIEDC offices, with the presence of senior representatives from both sides. 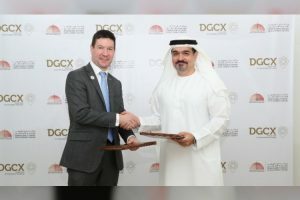 Under the MoU, DGCX will work with Dubai Islamic Economy Centre to promote the Shari’ah-Compliant Spot Gold contract, as well as any other Islamic financial commodity product subsequently developed by the DGCX to cater for the Islamic finance sector, while positioning Dubai as the hub of the Islamic economy.